There are plenty of opportunities to develop quality referrals - - you just have to look for them. 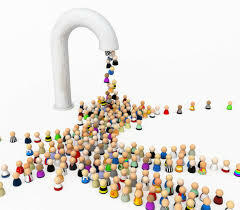 It is certainly true that larger networking groups can generate more referrals exponentially. True, that is, within each type of referral group. Among strong-contact referral groups, such as BNI, studies consistently show that a group with 40 members will typically generate more referrals per member than one with 25 members. It stands to reason: The more people in your group, the more Rolodexes you have access to. But the same thing happens among casual-contact networks like chambers of commerce; a 200-member group will probably generate more referrals than a 100-member group. However this doesn't imply that a 100-member chamber of commerce will pass more referrals than a 40-member referral-networking organization. The strong-contact group focuses primarily on generating referrals for its members and is structured so that there's time for passing information and referrals in each meeting, and members are personally accountable for generating referrals for other members of the group. A chamber of commerce offers plenty of opportunities to pass referrals, including forming some special committees that can serve as a strong-contact referral group. This type of organization is really made up of three parts: It is part information network, part service organization, and part referral group. Bear in mind that a master networker does not need solely a high-structured organization to generate and receive referrals. She can do this in almost any setting because she has highly developed relationship skills. She constantly looks for ways to help or benefit her networking partners, and she has a reputation as someone who can get things done, no matter what the organization or situation. For her, a casual-contact group can serve her just as well as a strong-contact group--perhaps better, because there are more possible connections in a larger group, whether structured to make those connections automatically or not. A master networker carries her entire network with her at all times and can make connections that benefit people in different industries, interest groups and geographic areas who probably would never have heard of each other without her help. This requires a strong desire to help others succeed. Constantly be on the lookout for people who need the services a member of your network provides. Despite the built-in structure and focus on referrals, a strong-contact group member can fail to generate referrals for other members or to receive referrals for himself. Networking skills are the No. 1 requirement; the setting only makes it easier to use these skills. Simply being a member of a strong-contact group does not entitle you to expect or receive referrals. Nor does being a member of a casual-contact group limit the number of referrals you can generate or receive, if you have the skills and use them. One savvy--and extremely successful--networker loads the names and cell phone numbers of every member of her networking group, and when new members join, she adds them to her "tele-rolodex" immediately. She has found that she has a better chance of seeing closed business between her contact and the person to whom she makes the referral when she can introduce them immediately--right when she learns her contact's needs. For example, you are at meeting with a client, who mentions that his wife is expecting twins, and he is consumed with trying to figure out the best life insurance options for his family. You have an extremely knowledgeable life insurance professional in your network, you tell your client, and that you would be happy to provide his contact information--better yet, you say, "Let me just get him on his cell." You give off an organized and well-connected impression, and, if you and this agent are close enough to be on a "cell-phone basis," you seem to know him pretty well, so your client's comfort level with your referral rises. Whatever you pay to join a referral-networking group is only an admission price--it gets you into the room where opportunities may come your way, but it doesn't entitle you to referrals. It's not enough to simply show up and participate. You must perform to make the most of these opportunities and new contacts.